For the record, I do not like Rand Paul. I think his libertarian ideology would see the better part of America holding gruel cups like Oliver Twist and begging for more porridge in miserable work houses built circa 1875 to further the blessings of the ever illusive ‘free’ market. The best that I can say about the man is that is he probably isn’t innately evil, he’s just deeply misguided. Like most Republicans he wants rich people to pay almost nothing in taxes, and he wants ‘big’ government to fail. In the infamous phrasing of Grover Norquist, he wants to drown big government in a bathtub—only, drowning ‘big’ government is an abstraction. What he’s really advocating is drowning hundreds of thousands of poor and vulnerable citizens. Let me state categorically that this is a good thing. Habeas Corpus was trashed at the first passage of the Patriot Act and hasn’t been reinstated since–by either the Bush administration or the Obama administration. Anybody that slows our Executive Branch enough to decry the stripping of basic human rights that have been in place since the Magna Carta is doing a good thing. 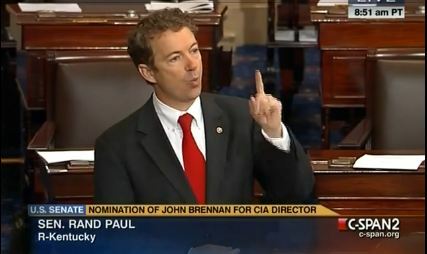 So kudos to Rand Paul for this filibuster. And Progressives and Democrats and Democrats in name only should take notice. This is what Democracy looks like. Maybe there’s a sweet spot here– a new ‘grand bargain’ so to speak. And it’s not really that complicated. On one side, don’t murder people without a fair trial -especially not US citizens – just like we promised in the constitution. Roll back the creeping power of the Executive Branch that began with Nixon, really took wings with George W. Bush and has not slowed an iota under Obama. Reinstate Habeas Corpus, and maintain a standard trial by jury of peers for every citizen (again, just like we promised in the constitution). No more Executive executions, either here or abroad. Suspend the portion of the NDAA that provides for military detention of US citizens on US soil. On the other side, don’t trash our national economy in a childish tantrum. Republican economic policies (and neoliberal economic policies, in general, for that matter) are deeply dysfunctional and everybody knows it. Furthermore, implementing these wildly unpopular austerity measures flies in the face of the popular will—as dictatorial a move in its own right as invoking Executive privilege. The majority of Americans don’t like the austerity measures, don’t agree with the Republican policies and do not want their Social Security savings cut or their Medicare benefits revoked to further enable corporate welfare or tax breaks for millionaires. That’s what these last elections proved. I’m not holding out much hope, but if our polarized country could agree on those two things: basic principles of fairness, really, maybe we could begin a long overdue national conversation about how to move forward in the 21st century.